The Math Explorer is another calculator introduced by Texas Instruments to perform fractional arithmetic for elementary school. In opposite to the Galaxy 10 the display size doesn't allow scientific notation. Nevertheless calculating accuracy is 12 digits! Dismantling this TI-12 Math Explorer manufactured in December 1992 by Toshiba in China reveals a clean design centered around a Toshiba T6M39S single-chip calculator circuit. 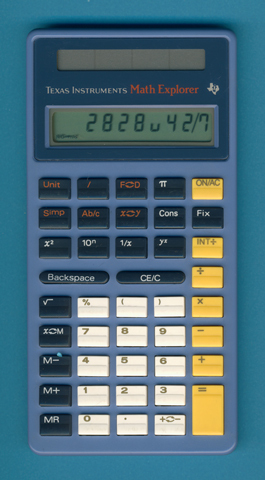 The calculator was produced both in Italy and China, view the minor differences here. Later the same keyboard layout was used with a more stylish housing. Compare it here. Math Explorer ™ is a trademark of Texas Instruments.